I am featuring one of My Favorite Things fabulous stamps, Fresh-Cut Flowers. This stamp offers so much versatility. 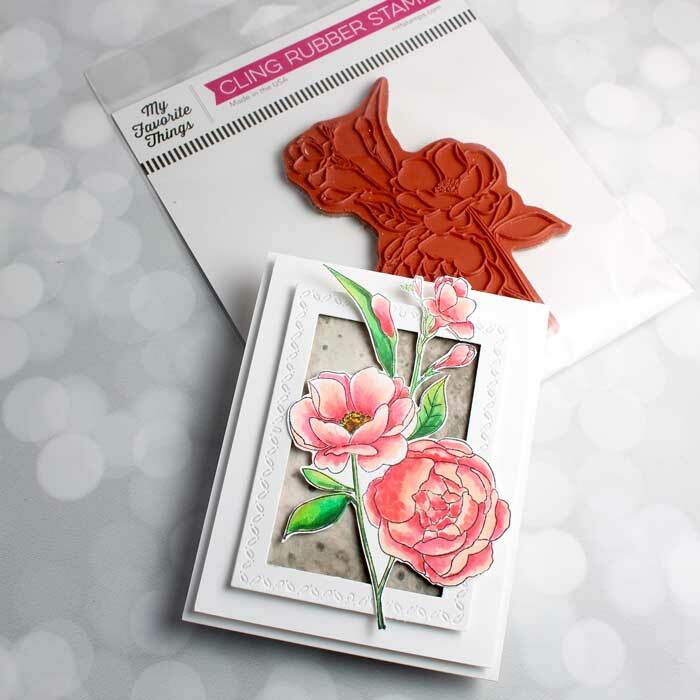 You can use it with any sentiment and nearly any recipient, making this stamp a real keeper!. 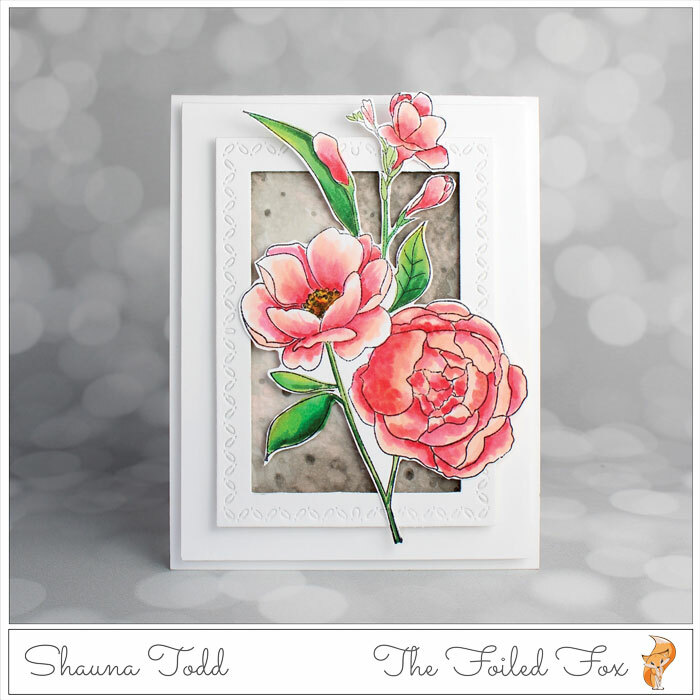 For this card design, I kept it simple with only the flowers, a background, and a border. This card is really simple to whip up. I decided to start with the basics so I created a white cardstock card base and a panel that is slightly smaller than the card base front. I popped up the panel by adding white foam to the back of it and mounted it on the card base. I set this aside for now and moved on to the coloring. 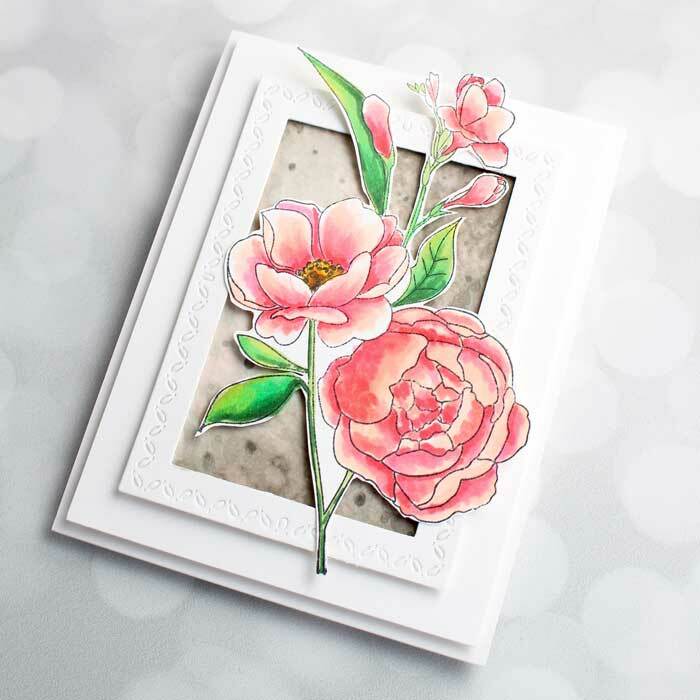 I started out stamping the flowers onto a piece of Neenah white card stock, thinking it would be a practice piece to test out the colors. But, when finished, I liked them quite a lot so they become the focal point of the card, but I am getting a little ahead of myself! 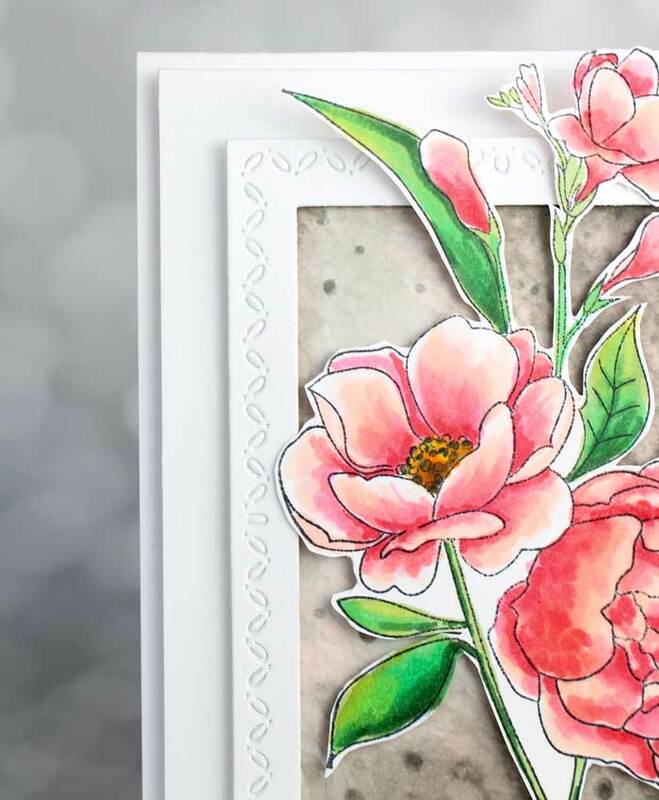 To back up a little, after I stamped the flowers, using Memento Tuxedo Black ink, onto a piece of Neenah white card stock, I colored them with Copic markers. It is fairly simple coloring. I started with the light colors and worked myself up to the darker colors for shading. I then go back and smooth out the coloring with one of the lighter colors. Here is a guide to help. After the flowers were colored, I fussy-cut around them and set them aside too. Again, I was just experimenting with the background. I pulled out my warm gray Copic markers to see how they would look as a background. I used W1, W3, W5, and W7 in the warm grays to create a mottled look. It didn’t take long but it does use up ink so if you are concerned about that, a water colored background will work well too. All the elements were nearly done, all that was left was to cut a frame using the Stitched Stackers die set by Penny Black. I then added foam tape to the back of the frame and attached the background. Then, added the frame and background to the top of the front panel and the flowers were adhered to the front. I decided to leave a sentiment off for now. I know I can always add one later or just leave it so the flowers speak for themselves. Shauna, this is so very very lovely. The flowers are warm colours that I love. I think you were right in not adding a sentiment because, as you said, the flowers speak for themselves.